Welcome to the Shenandoah National Park Information Page. 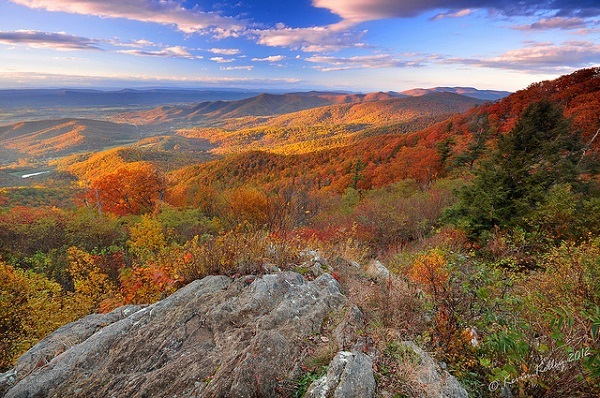 Shenandoah National Park is located in northwestern Virginia, northwest of Charlottesville, Virginia. The Park is approximately 75 miles west of Washington, DC and the Headquarters office is located 3.0 miles west of Thornton Gap and 4.0 miles east of Luray, Virginia on U.S. 211. Since there are no bus, taxi or shuttle services through the Park, a car is needed. Accessible by I-66 and Highway 340 South to the north entrance at Front Royal, Highway 211 for the central entrance at Thornton Gap, Highway 33 at Swift Run Gap and I-64 at the Rockfish Gap entrance. Speed limit for the Skyline Drive is 35mph. There is No bus or train services. Taxi service is available from Front Royal, Luray and Waynesboro to areas in the Park. From Front Royal to the first visitor center, Dickey Ridge, is 5 miles, to Skyland is 42 miles. From Luray to Thornton Gap Entrance Station is 9 miles, to Skyland, 19 miles and to Big Meadows, 29 miles. From Waynesboro to the Loft Mountain area is 30 miles and to Big Meadows the distance is 60 miles. The total acreage is 196,466.19, including 79,579 acres of the designated wilderness area. The highest visitation is during the fall color season and the summer months. Traffic can be heavy on Skyline Drive during these weekends. Shenandoah National Park lies astride a beautiful section of the Blue Ridge, which forms the eastern rampart of the Appalachian Mountains between Pennsylvania and Georgia. In the valley to the west is the Shenandoah River, from which some feel the Park gets its name, and between the north and south forks of the river is Massanutten, a 40 mile long mountain. To the east is the rolling Piedmont country. Providing vistas of the spectacular landscape is Skyline Drive, a winding road that runs along the crest of this portion of the Blue Ridge Mountains through the length of the Park. Wilderness…the word has different meanings to different people, but here in Shenandoah National Park, wilderness is something special. Of the park’s nearly 196,000 acres 79,579 have been designated by Congress as wilderness. But what does this mean? In 1964, the Congress of the United States passed a law known as the Wilderness Act, which created a National Wilderness Preservation System to provide an “enduring resource of wilderness” for future generations. President Lyndon Johnson signed the Wilderness Act into law on September 3, 1964. Today, over 100 million acres across the country are protected as wilderness. Wilderness, according to the Wilderness Act, “…in contrast with those areas where man and his own works dominate the landscape, is hereby recognized as an area where the earth and its community of life are untrammeled by man, where man himself is a visitor who does not remain.” The Wilderness Act goes on to describe wilderness as a place “retaining its primeval character and influence” where there are “outstanding opportunities for solitude”. Most comfort stations and buildings are accessible or accessible with help. Overnight accommodations are available at Lewis Mountain, Skyland and Big Meadows Lodge. The trail circles through an old-growth forest of magnificent hemlocks and includes a 65 foot bridge and 150 foot boardwalk. Shenandoah National Park lies astride a beautiful section of the Blue Ridge, which forms the eastern rampart of the Appalachian Mountains between Pennsylvania and Georgia. In the valley to the west is the Shenandoah River, from which some feel the Park gets its name, and between the north and south forks of the river is Massanutten, a 40-mile-long mountain. To the east is the rolling Piedmont country. Providing vistas of the spectacular landscape is Skyline Drive, a winding road that runs along the crest of this portion of the Blue Ridge Mountains through the length of the Park. Backcountry Camping Most of Shenandoah National Park, including its wilderness, is open to backcountry camping. Special regulations for backcountry camping are intended to keep campers and the park in the best possible condition. A free permit is required for backcountry camping. Permits are available by mail from Park Headquarters. Entrance fees are based upon the total capacity of the vehicles that can carry seven or more passengers. Possession of a national park passport or the age of the passengers does not affect the price charged. Entrance fees are valid for the day of purchase and the next six days for a vehicle carrying the same group of passengers. A Virginia fishing license is required for those between 16 and 65. There are more than 150 miles of horse trails in the park. Visitors may bring their own horses, or sign up for a guided trail ride from the Skyland Stables (May through October). Horseback riding is available at Skyline, weather permitting. Riders must be at least 4 ft 10 in height. Pony rides are available for children. Even though it may appear long, this list totals fewer than 20 miles of the 500 miles of trails in the park! The mountains in Shenandoah National Park are usually 10 degrees cooler than the valley below. Winters can be severe with snow and ice and summer showers are the usual. Layered clothing is always suggested.